Antigua and Barbuda is a small island republic in the Caribbean. Besides its main namesake islands, it consists of several smaller ones. It is one of the smallest countries of the world and has less than 100,000 inhabitants. It is, however, a popular tourist destination, especially owing to its beaches. Antigua and Barbuda is a former colony of the United Kingdom and while independent, is officially still ruled by Queen Elizabeth II. The national dish of Antigua and Barbuda is funji/fungie, a cornmeal dish similar to Italian polenta. Common ingredients include seafood (especially salted fish), rice, fruit, peppers, pumpkin, zucchini, tomatoes, okra, eggplants and plantains. Pasta is also popular. 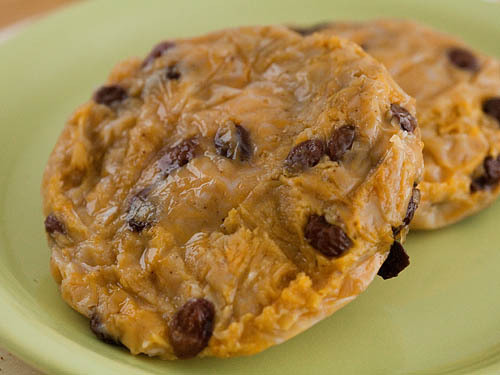 Ducuna (also spelled ducana) is a sweet potato cake/dumpling (even though it may look like a cookie in my photo). Wikipedia says they often include coconut, nutmeg and vanilla, but the most common recipes circulating on the Internet don’t have these ingredients. Intrinsically vegan, they are tasty in a bit bland way – someone compared ducuna to apple pie filling. Grate the sweet potato fairly finely. Mix in the sugar and leave for 1-2 hours. This will draw in liquid from the sweet potato, so you will likely not need to add any water. Add all the other ingredients and mix well. If the dough seems quite watery (as mine did), add more flour, or add water if needed (I guess it mostly depends on the size of your sweet potato). Spoon the dough onto aluminum foil square and form into circles (I made four ducuna out of this dough). Wrap as tightly in the foil as possible. Place the packets in boiling water and boil for 50 minutes. Note that they may be very mushy and sticky if you open them immediately afterwards, so let them cool a bit first. Serve hot or cold, perhaps with a vegetable stew or as a dessert/breakfast/snack. This entry was written on December 12th, 2010 by Maija Haavisto and filed under Caribbean, Side dishes. having on many occasions helped in the making of Ducuna I am now equiped to make them with your recipe as I have forgotten my mums. Where we are at odds however is that we used Coconut – in a goodly quantiy – in ours would you provide a a recipe inclusive of the amount of Coconut used please. This is the recipe I have. If you’re talking about desiccated coconut, you can probably just add it to the recipe. having on many occasions helped in the making of Ducuna I am now equipped to make them with your recipe as I have forgotten my mums. Where we are at odds however is that we used Coconut – in a goodly quantity – in ours would you provide a a recipe inclusive of the amount of Coconut used please.